Robin Hood may not have roamed Sherwood Forest for hundreds of years, but fans of his "steal from the rich, give to the poor" ethos appear to have made inroads into European tax policy. 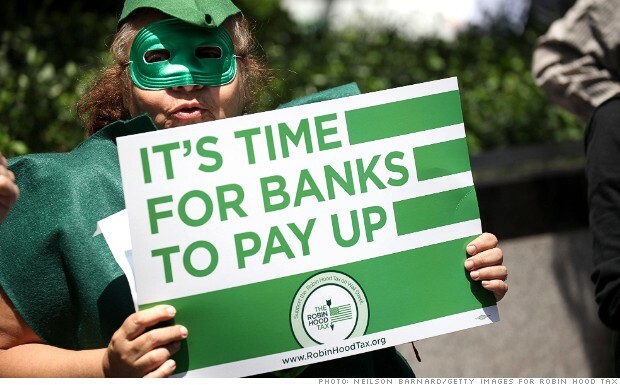 The European Union's executive body said Tuesday that 10 members of the 27-nation group had agreed to move forward with a Financial Transaction Tax, also known as the Robin Hood tax. Supporters say the controversial move will raise billions of euros for cash-strapped governments by applying a small tax on transactions in financial markets. But critics say imposing the tax will drive investors away and act as a break on economic growth. Nobel Prize wining economist James Tobin first proposed taxing transactions in the foreign exchange market in the 1970s to limit volatility and curb speculation. The idea of taxing financial transactions more broadly really started to gain ground earlier this year, when former French President Nicolas Sarkozy began touting it as a way out of Europe's financial crisis. The tax has become a cause célèbre of grassroots organizations that often dress up in Robin Hood costumes and march in the streets. It has also been affiliated with parts of the Occupy Wall Street movement in the Untied States. After failing to reach a unanimous decision, the European Commission said it has the legal grounds to proceed with the tax after 10 nations agreed to "enhanced cooperation" on the proposal. The details were hammered out by eurozone finance ministers earlier this month, and they will revisit the issue in November. The decision was backed by the largest economies in the euro area, including Germany, France, Spain and Italy. It was also supported by Austria, Belgium, Greece, Portugal, Slovakia and Slovenia. But the tax is politically charged and implementing it could still prove difficult. Despite gaining traction in the eurozone, it's a non-starter in the United Kingdom, which is a member of the EU but does not use the euro. This raises questions about the effectiveness of the tax, since London boasts some of the largest capital markets in the world. "We are watching this development with interest - particularly given London's role as Europe's leading financial centre," said Mark Boleat, policy chairman at the City of London Corporation. Algirdas Šemeta, the European commissioner in charge of taxation, said he hoped other members of the 27-nation EU would eventually adopt the tax, although he said it could still be effective without full participation. Under a proposal Šemeta put forward last year, the transaction tax would raise up to €57 billion if it were applied in all 27 EU nations. Based on the commission's initial proposal, the transaction tax could raise €37 billion if implemented by the 10 countries in question, according anti-hunger organization Oxfam International. The EC did not provide its own estimate but said the financial sector is "under-taxed by about €18 billion a year in Europe." The revenue could be used to help fund the EU budget, easing the burden on individual member states, which could use the funds to pay down debt and stimulate economic growth, among other things. "This is a once in a generation chance to ease the burden on European citizens," said Nicolas Mombrial, Oxfam's EU policy advisor, in a statement. "Countries which have not signed up should do so or risk finding themselves on the wrong side of history." Of course, the financial sector sees it differently. Richard Middleton is a managing director at the Association for Financial Markets in Europe, which represents leading European banks. He argues that taxing financial transactions will hurt the European economy and could even cause tax revenues to fall. "Europe needs to focus on rebuilding its economies and fostering recovery," Middleton said in a statement. "Its leaders should reject this proposal as potentially damaging to their economies."